Plus, science says it can help lower stress and boost your immune system. In Japan, we practice something called forest bathing, or shinrin-yoku. Shinrin in Japanese means ‘forest’, and yoku means ‘bath’. So shinrin-yoku means bathing in the forest atmosphere, or taking in the forest through our senses. When people started to practice shinrin-yoku, in the early 1980s, it was based only on common sense and the intuitive idea that being in the beautiful green forests of Japan would be good for us. The term was invented in 1982 by the then Director General of the Agency of Agriculture, Forestry and Fisheries of Japan, Tomohide Akiyama, who stated that the people of Japan were in need of healing through nature. The idea was also part of a campaign to protect the forests. If people were encouraged to visit forests for their health, they would be more likely to want to protect and look after them. The forests of Iiyama are some of the most beautiful and unspoilt in Japan. With the giant beech trees of Mount Nahekura and the snowmelt waters of the Chikumagawa (also known as the Shinanogawa), the country’s longest river, the landscape is romantic and quintessentially Japanese. 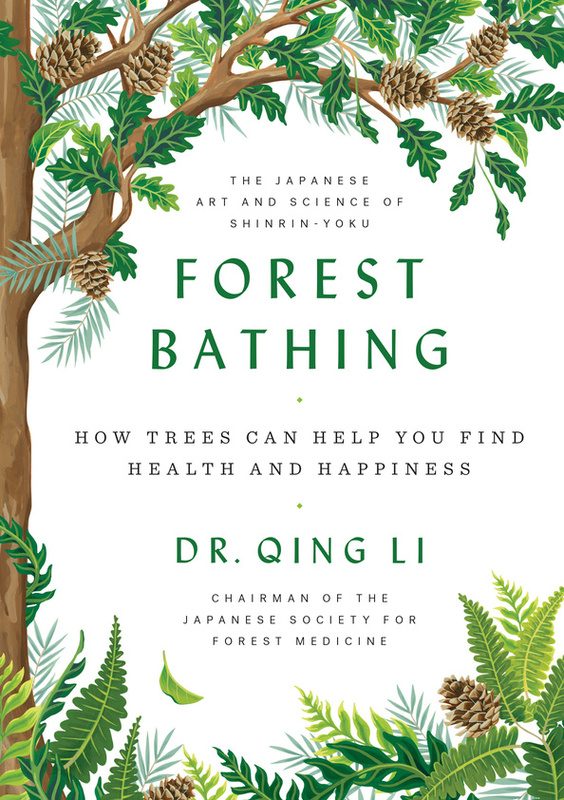 Based on the results of that forest-bathing study in April 2006, Iiyama became the first location in Japan to receive forest-therapy certification. The ‘green healing’ power of Iiyama’s forests had been scientifically demonstrated. There are now sixty-two certified forest-therapy bases in Japan, all of which have been proved to have particular healthful properties, and between 2.5 and 5 million people now walk the forest trails every year. We have now conducted numerous studies and collected a huge mass of data from hundreds of people on the impact of forest-bathing on various aspects of human health. For example, we discovered that forest-bathing can help you sleep – something I studied in Iiyama city with those twelve businessmen. The participants took two-hour walks in the morning and afternoon in different forests. They walked around 2.5km in two hours – roughly the same distance they would walk on a normal working day. I measured their sleep activity with a sleep polygraph and an accelerometer – a counter you wear on your wrist like a watch which judges the number of physical movements you make – before, during and after the trip. Fewer than forty body movements in a minute indicates that a person is asleep. Before the forest-bathing trip, these men had an average sleep time of 383 minutes. On the nights during the trip, this rose to 452 minutes. And on the night after the trip, it was 410 minutes. In other words, there was a significant increase in sleep time during the forest-bathing trip, proving that you sleep better when you spend time in a forest, even when you don’t significantly increase the amount of physical activity you do. I can’t think of a better way to establish our connection to the forest, to feel its power and importance for ourselves, than to go for a forest bath. When you are intimately connected to the forest through all five of your senses, you feel restored and refreshed. The forest can bring you back to health and life, and you will want to conserve and protect it in turn.